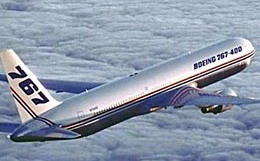 The narrowest wide body in service, the Boeing B-767 features an impressive range and a cabin unique in its width, typically seating 7 abreast in economy configuration. In addition to seating 326 passengers, one of the most in the class, the 767 boasts a fast cruising speed of 459 mph. The Boeing 767-300ER's standard layout sports 7 lavatories, and can carry up to 350 passengers in a single class configuration, 269 in a 2 class configuration, or 218 in a 3 class configuration. 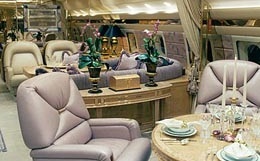 The cabin is in a widebody layout with 2 seats on the outboard side of the cabin, with 3 seats in the middle. The flight deck is managed by two pilots and has a complete suite of advanced avionics at their disposal to ensure flight safety. The Boeing 767-300ER's greatest advantage is that of its range. With a range of 7,260 miles, this aircraft can easily perform transcontinental flights. The aircraft also has a top speed of .85 mach or 567 miles per hour. Equipped with advanced avionics, the Boeing 767-300ER has the ability to fly in and out of major airport even if they are completely obscured by fog, or precipitation. For more information about chartering, leasing or buying a Boeing 767-300ER please contact us by calling +44-20-3874-8091 or send us an email here.